What became of Man Utd? So I've started as Newcastle, this is a save which I got a bit excited about, I think Newcastle aren't so big that it feels like a challenge but not too small either. I have made just the two signings, but I think they will be integral to the squad, they are Agustin Marchesin and John Stones. John Stones cost me £17.5m and Agustin Marchesin was £4.2m from Lanus, this was made possible through the sale of Moussa Sissoko and Yoann Gouffran, I didn't think they were key to success having looked at them on FM15. The one other player I sold was Tim Krul who requested to leave after many negotiations to try and get him to stay, he was sold to Napoli for £9.25m. I have also been trialing a new formation, the 5-4-1 Diamond WB formation, which proved successful in our 3-1 victory at home to Liverpool. It also gives me a chance to bring Cheick Tiote into the squad by utilising the DM position, this looks like a formation that suits the make-up of our squad, we are currently in 10th place after 4 games. Two of the signings to backfire on us were those of Mehmet Topal and Kevin Kampl, we had agreed terms with both these players, Mehmet Topal opted to join Monaco instead of us and Kevin Kampl failed a medical due to an injury that had ruled him out for 3 months. We also came close to signing Fernando Muslera from Galatasaray, we had a £9m offer accepted, but his wage demands were just too high for us to agree to. A good 3-1 win at home to Tottenham in our 7th game of the season put's us in 7th place, I wasn't expecting that we would win buy a 2 goal margin, John Stones scores again. He's beginning to form a habit of grabbing important goals for the club, John Stones and Daryl Janmaat are named in the team of the week after their performances in the victory over Tottenham. More good news in terms of signing, Newcastle have finalised the signing of Victor Valdes, because he is a free agent the transfer will go through immediately. When he signed he was instantly my most valuable player at £12m, he is 32 which is a decent age for a goalkeeper and will have at least a few years left at the top. In the January transfer window we signed Diego from Fenerbahce for £5.75m, Sebastien Corchia for £8m and Aiden McGeady for £7.5m, we sold Davide Santon and Vurnon Anita, hopefully this will strengthen the squad further. We have Ricardo Carvalho joining for free in the summer, the bad news is that I was sacked in the second season, so it looks like I will be trying another attempt with Newcastle. I completely exhausted myself with trying to find the right formation so I decided to resort to the internet, I found an interesting file that can be downloaded from FM-Base, entitled FOLLIA V.1. So far it has been a major improvement on anything else I have tried, the tactics on FM15 are certainly tricky compared to previous versions. I will upload an image of the formation with my team selection below. The specifics of the formation are in the upload, noticeably all the strikers are deep lying forwards set to attack, mentality is attacking and team shape is very fluid. This formation must have taken a lot of experimentation because it is quite in-depth in terms of detail compare to my usual formations. After 3 games I have been Sunderland 5-1 at home, lost 2-1 to Leicester City away and beat West Ham at home 6-0. I know these results have come against lesser opposition, but these were teams I genuinely scraped victories against, and sometimes lost to under previous formations. I'm not sure why this formation works as well as it does, this is probably a good point to mention the additions to my squad, I have signed Marcell Jansen for £3m from Hamburg. Marcell Jansen was great addition in my previous attempt, and was a source of many vital assists from left wing back, I have also signed Giampaolo Pazzini from AC Milan for £2.6m. And my final signing of the summer transfer window was Rolando from FC Porto for £2.7m, he looks like a fairly key addition in Centre Back and provides competition for Steven Taylor and Mike Williamson. The formation is amazing, we are top of the league by six points, and our squad isn't full of Messi's and Ronaldo's, the tactic works perfectly. I think the game might start getting a bit easy now I know this tactic, I also can't understand why the other teams are not using this if it is the best formation, I have never used such a successful formation in all my time playing Football Manager. We have the 3 players with the highest average ratings in the league, they are Cabella, Anita and Ferreyra. They never got these average ratings in any other formation, so I'm putting success on FM now down to purely being a tactical thing, this formation has the same effect has having a team full of physically over-powered regens. 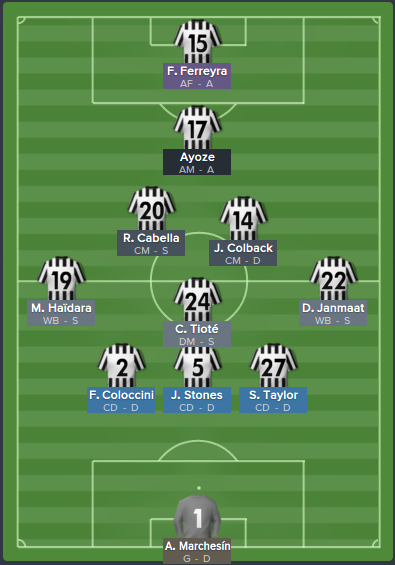 I hope that more FM15 players will try this formation if they want instant success, I will be trying it out for ages to come. 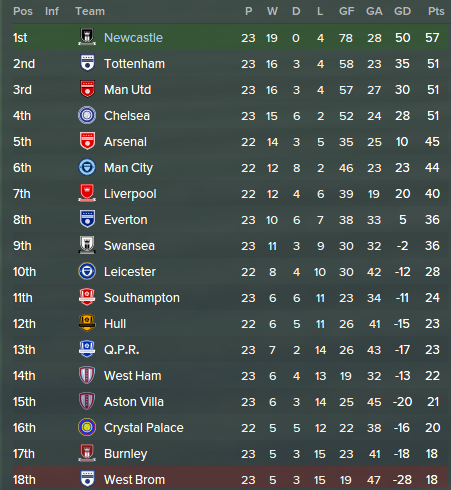 Newcastle are champions of England, with 2 games to spare, the formation has been a great success. It seems almost unbelievable. Our biggest result of the season was our 9-1 win at home to Leicester City, with contributions from all 3 of our strikers, we had many good results this season with healthy goal difference margins scoring 121 goals in 38 games. We ended the season with the 1st and 2nd top scorers, Giampaolo Pazzini and Facundo Ferreyra, we also had the 3 players with the highest average rating over the course of the season. 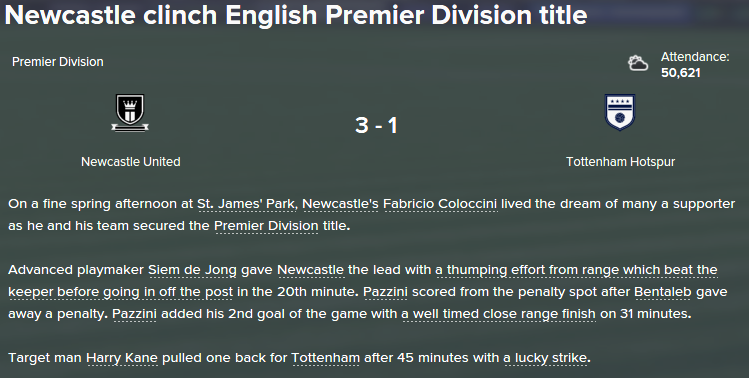 And got 2 players in the top 4 for assists, they were Ayoze and Giampaolo Pazzini, they both play as strikers for us. We were awarded £21.15m for finishing top of the league, as well as qualifying for the champions league, this should allow us to make some much needed investments in our squad. Our reputation has gone up half a star since I took over. Charlton's victory over Newcastle on a mild summer's evening at The Valley saw a number of players continue their ever-present runs for The Addicks this season. Newcastle were nearly handed the lead in the 38th minute through Andre Bikey-Amougou's lapse in concentration but failed to capitalise. Advanced forward Igor Vetokele gave Charlton the lead with a close range effort in the 44th minute. Then followed controversy as Charlton were denied claims by target man George Tucudean for a penalty. Vetokele added his 2nd goal of the game with a simple finish from close in on 75 minutes. Young striker Alex Gilliead's 93rd minute strike proved the only consolation for The Magpies.